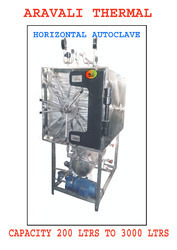 We are a leading Manufacturer of rectangular horizontal autoclave from Sonipat, India. "Aravali Thermal" manufactures highly efficient rectangular horizontal/ Vertical/ Cylindrical autoclaves. The autoclaves are available in hinged type door, pneumatic type sliding door. The autoclave is hydro tested, fitted with vaccum pump and Plc based control panel. The autoclave is available in capacity starting from 200 ltrs per hour to 3000 ltrs/hr.